This entry was posted in Uncategorized and tagged Beef, cooking, Dining, food, health, lunch, Salad, Steak by christao408. Bookmark the permalink. Mmm, my kind of salad! Tomatoes have lots of antioxidants, very healthy meal! I agree, eating out makes your wallet thinner! It is cheaper and healthier to eat at home. I think that is the number one advantage of working from home. I do eat healthy at home – but as you say going out to dinner or events can be a problem. I hope the weekday meals balance off the “outside the house” meals. Thinning wallets seem to be a universal problem. *sigh* I am on a low cholestrol diet. I am swooning for lack of cheese. Cheese is the elixer of life. I miss my cheese. btw -I discovered that fat free milk is nasty. Hope you can continue to eat health(er). @murisopsis – Somewhere I had read that the cholestrol in dairy products does not necessarily cause an increase in the cholestrol in the blood. Don’t know if that is true, but I would certainly like it to be so. @Fatcat723 – @CurryPuffy – Thinning wallets certainly are a widespread phenomenon! @ClimbUpTreesToLookForFish – The short commute being advantage number two! @yang1815 – But that just means more of you for Sugi to love! 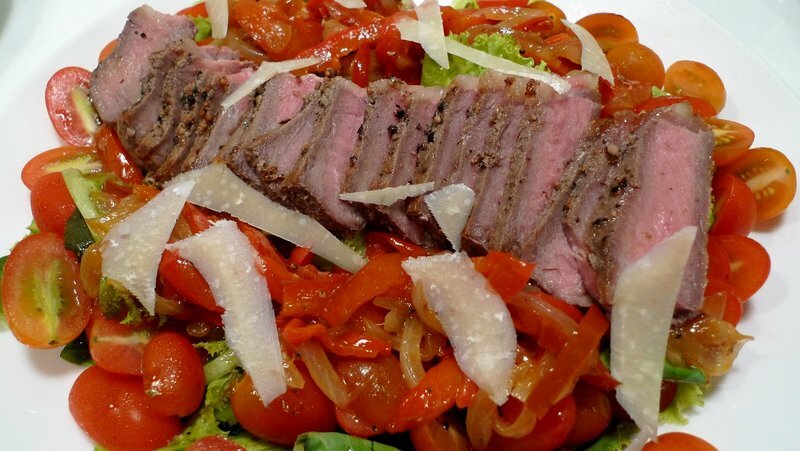 LOL@Roadlesstaken – Yeah, steak makes most any salad better. Ha ha! I love having breakfast at home. Something I get to enjoy only during weekends. That actually looks pretty good. I like to use peppers in lots of meals. I try to eat healthy at home and also at work. But I will indulge when I have a social appointment. That salad looks extremely good Chris. I should make that here. I’m afraid many of us share that odd calculus. i eat breakfast at home almost always, and it is either cold cereal or hot oatmeal. ironically, if i had to buy lunch it’s cheaper for me to do so near my workplace than near my house, so i actually prefer heading in to work and having lunch there (the ability to socialize a bit is nice too). eating out certainly is expensive — but i guess you can say that we are just trying to support the local economy! Eating out is a killer for a lot of budgets. It’s always interesting to see what others eat when they are at home and not making a 7 course meal. My breakfast are usually cereals, or peanut butter and jam sandwich.